As I’m working feverishly on my novel for National Novel Writing Month (18,000 words, thanks for asking), I’m approaching the first Saturday of the month. Which raises a question for me. Do I work on the novel on the sabbath? On the one hand, I try not to use a computer on Shabbat, because it’s too work like. And in some ways, this writing really is work, in the sense of productive labor. On the other hand, I’m having a lot of fun writing, and it’s a spiritual activity, especially given the spiritual themes of the novel. And, after all, I’ve got 50,000 words to get done before a deadline. I really don’t know where I’m going to come out. There is work I’m willing to do on Shabbat (like lead services, for instance). But without boundaries, Shabbat ceases to have true meaning. Studying spiritual text is very traditional as a Shabbat activity. But writing it isn’t. I’m balancing, weighing the questions, trying to find a comfortable result. I’m trying hard not to let the target of 50k words drive my decision. That’s not what Shabbat is about, and frankly, that drive is the most compelling reason to me NOT to write on Shabbat: the goal oriented nature of 50,000 words is very much not shabbastik (doesn’t feel like shabbat). A more traditional Jew doesn’t wrestle with these questions. There are clear boundaries that one adheres to. For those of us who seek to live by finding our own path through the tradition, creating meaningful ways of celebrating and observing, the questions are tougher. Competing values come into play, and the decisions are up to us, not the rabbi we ask for a ruling. For now, I remain undecided, but leaning towards writing. But tune in next week for the answer. I’m a rabbi. Yet even I struggle with celebrating Shabbat and the holidays, setting them apart the way I wish to. I don’t tend to work on Shabbat, but lately it hasn’t felt as special as I’d like it to feel. And I’m realizing that a part of this is that I don’t use all the tools at my disposal to make it special. Jewish tradition teaches that we should begin the sabbath by lighting candles, saying a blessing sanctifying the day over a cup of wine and eating a relaxed meal. Many people also go to synagogue to begin Shabbat with a service. The end of Shabbat is marked by another ceremony, maybe 5 minutes in length, called havdalah. These rituals serve as signposts in time, separating a day of sanctity and rest from the rest of the work week. Yet recently, I’ve been neglecting all of these rituals. Shabbat happens whether I observe the rituals or not. I even observe Shabbat by not working whether I observe the rituals or not. However the time feels different when set apart by ritual. I am able to mark beginning and end, to know when the computer must be turned off, and when I can turn it back on. These markers are important to feeling the full impact of the day, not because it changes what I do on the day, but because it changes the intentionality with which I do it. The closest comparison I can make is the difference between killing time by playing a video game and playing a video game with the intention of giving oneself a break from work. When one is consciously taking a break, one is more refreshed afterwards. The rituals of Shabbat are sort of like that. So with all these good reasons for using the rituals of Shabbat, why haven’t I been? Habit. When at CubeSpace we got out of the habit because when we got home at the end of the week we were too tired for anything other than complete collapse. After CubeSpace’s demise, I think it just didn’t occur to us to change our pattern. But now, it is time to change patterns. It is time to engage with the rituals once again. To make shabbat rather than just letting it happen. It’s great marketing for CubeSpace to have 350 people come through. We aren’t set up to have 350 people come through CubeSpace without us being present. Nonetheless, it does mean working on Shabbat. Which made me think about the intersection of spiritual community and CubeSpace community. In many ways, it feels like the CubeSpace community has become my spiritual community: it is the group that it feels “right” to spend Passover with. It is the community I share news with. It is the community I enjoy partying with (see above re: BarCamp). So spending Shabbat this way does not feel entirely inappropiate. While there is definitely the resting and recharging element of Shabbat, there is also the celebration and joy element. This week, clearly, is going to be more about the celebration and joy. This week, will be about connecting to the community. Partying with some of the folks I see daily, and some I see only once a year, and no doubt meeting some new folks. It is the opportunity to learn something new…and maybe teach something. Tonight and tomorrow will be a whirlwind of food, fun, friends, and general geekery. I will emerge at the end exhausted, but having had a good time. In Judaism, we most often pray in community. We most often practice spirituality in community. Today, the Portland Tech Community gathers together, and joins in a spiritual event, even if I’m the only one labeling it as such. It will involve our spirits, affect our spirits, which makes it spiritual (the fact that we’ll be drinking spirits is just a bonus). Shabbat Shalom, all…or at the very least have a raccous Shabbat of celebration. I don’t normally post on Saturday, because that’s shabbat and I try to stay off of the computer on shabbat. Today, however, being on the computer, writing this post, may be the closest I get to shabbat: remembering and marking the day by noting the absence. Today, we are hosting a conference (unconference) at CubeSpace. Which means we have about 100 people here, in various states of organization, and I’m part of the host. And also trying to do a whole bunch of networking. None of which is particularly shabbastic (shabbat-like). [Returning now after major kitchen cleanup]. I completely lack the consecutive attention span to write this post. So I’ll try to do it really quickly before someone else comes up with a distraction. Shabbat used to be something I didn’t compromise on: I didn’t work on shabbat. Unfortunately, like immigrant entrepreneurs a century before us, we’ve discovered that the job really requires working on shabbat, at least once in a while (a while being most often described as a “month”). I miss the old way of doing things, when life really did slow down on shabbat. I felt better physically, and was able to appreciate shabbat more. Now, all too often, my observation of shabbat is noting my lack of observance, which just isn’t that satisfying. In any case, that’s my minor thought for today. I spent an amazing weekend with Temple Beth Tikvah in Bend. It’s one of the few times when, as I rabbi, I did something that really made a difference that I can talk about. Most of the time, when I make a difference in my rabbinic work, it involves a person, and is their story to tell. When working with a group, I’m able to talk about it a little more. The congregation is just starting out, having hosted spectacular high holiday services last month, is beginning to get around to thinking through what they do the rest of the year. They have about 30 families, which is amazing for a congregation that is only 6 months old and doesn’t really have much going on regularly yet. This weekend, I led services for them, taught some adult ed, and also taught a class for the kids. In addition, we talked a lot, and I did some organizational consulting. The group of people in Bend is great, and are developing a really strong organization. However, this is a group that doesn’t have much experience starting a new congregation. In fact, the group doesn’t have a lot of experience with startups in general. In contrast, I’m immersed in startup-land, and have worked with a number of congregations in the early stages of development. As a result, I was able to give some advice that they were excited to recieve. How weird is that? I gave advice and it was valued! online as early as possible, because that’s a big motivator for people to join. Some of it was based on marketing experience: it’s easier to sell a product that exists than vaporware. The giving advice part of the weekend was fun, but maybe not the most exciting thing I did. This weekend, for my adult education session, I took a risk. I decided to try to teach mysticism. Mysticism is really difficult to explain, but a fascinating philosophy of life. Mystical texts tend to be very technical, and hard to find a way into without a whole lot of context. Nonetheless, I decided to give it a shot. I taught Rabbi Abraham Isaac Kook on love–and it worked! People understood both the text and mysticism by the end of an hour and a half. And I got to teach a text I really love. I had a lot of fun this week end, and sense the congregation did too. I also got to drive into Central Oregon, which is beautiful high desert. I took a few photos on the way back…of the point and shoot variety, since I was driving at the time. But take enough shots, and some will turn out, even if you don’t look at what you’re photographing (and post-production helps a lot, too). So, for those who don’t know the beauty of Central Oregon, there are a few photos accompanying this post. 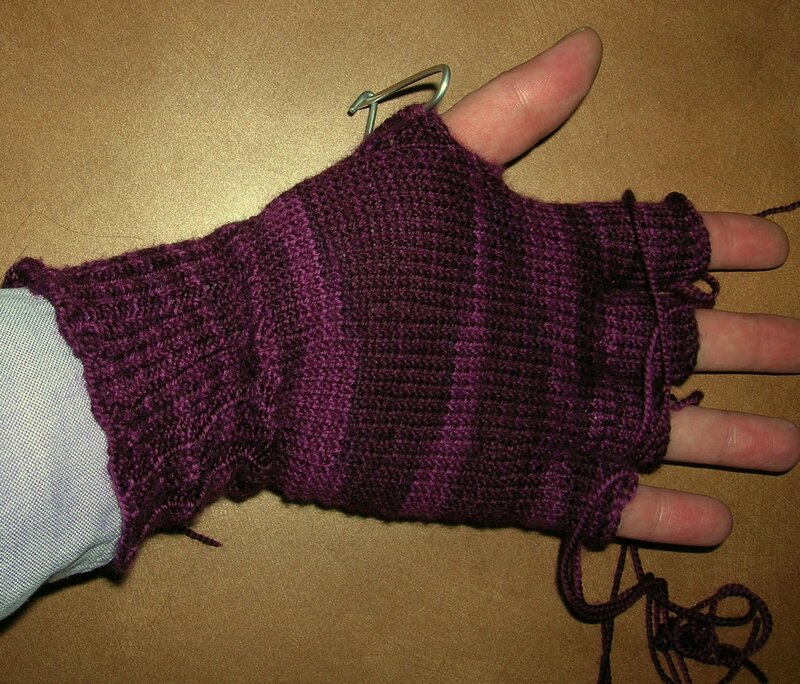 The gloves I was working on to have done by Monday evening? Looks pretty good, right? 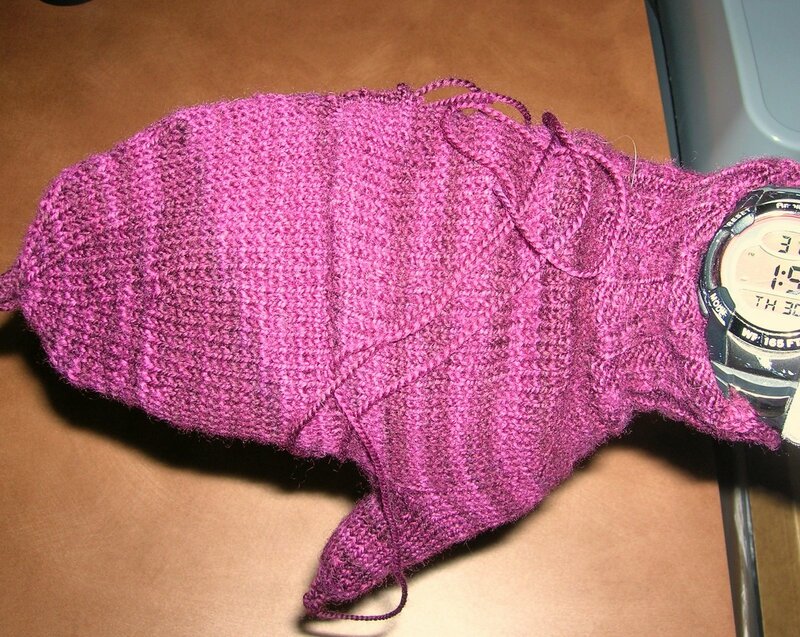 Just need to weave in the ends. Fail! 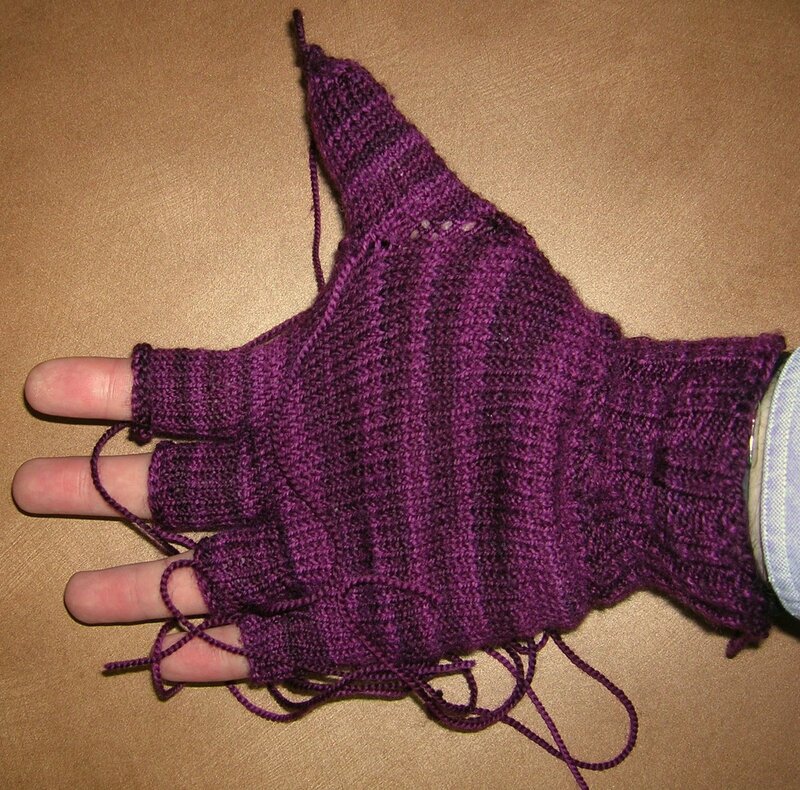 Note the lack of a thumb, and there’s no mitten shell either. (It’s almost done now). Other projects I’ve been working on this week: trying to learn Drupal. This has involved spending most of three days trying to install web servers on various computers, which led to installing various forms of Linux on two computers, repartitioning various hard drives, and basically wasting at least 15 hours. Also, spent about 56 hours at CubeSpace and did 2 wedding meetings. I’m delighted that the week is over, and very much looking forward to a shabbat of rest and “Moonlighting” (the TV show, not adding another job).